, we're excited to share a few new innovations in the areas of real-time, mobile and social search that we feel are important steps in the evolution of information access. Our real-time search enables you to discover breaking news the moment it's happening, even if it's not the popular news of the day, and even if you didn't know about it beforehand. 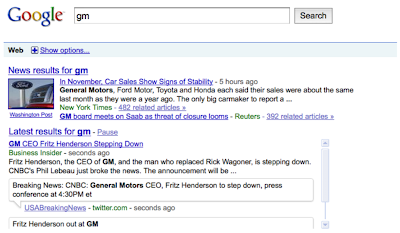 For example, in the screen shot, the big story was about GM's stabilizing car sales, which shows under "News results." Nonetheless, thanks to our powerful real-time algorithms, the "Latest results" feature surfaces another important story breaking just seconds before: GM's CEO stepped down. We have also made some new strides with mobile search. Today's sensor-rich smartphones are redefining what "query" means. Beyond text, you can now search by a number of new modes including voice, location and sight — all from a mobile device. So we've been working to improve technology that takes advantage of these capabilities. Starting today, we're extending our voice search capabilities on Android devices to recognize Japanese. In addition, we're using the location of your mobile phone to launch some helpful features, like showing you "what's nearby." Finally, at our event this morning, we demonstrated Google Goggles, a visual search application that lets you search for objects using images rather than words, using your camera phone. For more information on these mobile innovations, check out the Google Mobile Blog. That's why today, at the Computer History Museum, we're excited to share a few new innovations in the areas of real-time, mobile and social search that we feel are important steps in the evolution of information access.